Fanack Home / Palestine / Past to Present of Palestine / What is Delaying Gaza’s Reconstruction? In October 2014, an international donor conference on rebuilding Gaza was held in Cairo. The conference concluded with the participating governments pledging a $5.4 billion in aid for Palestinians. Half of the promised amount was to be used for reconstructing the Strip, which had been destroyed by an Israeli offensive in July 2014. The remaining funds were intended to support the budget of the Palestinian Authority through 2017. However, the donors had two preconditions. They stipulated that the newly formed Palestinian national-unity government be in charge of the reconstruction efforts and of operating all Gaza’s border crossings. The conditions were clear, and they meant that Hamas would have to step back from running the crossings that it had dominated since 2007. The donors’ conditions have constituted a political and security challenge for the national -unity government, as it has not been able to work a deal with Hamas. Several members of Hamas refuse to accept that they have to stop single-handedly running the crossings. Their reluctance has made the reconstruction process depend on the national-unity government’s success in running Gaza’s crossings. Israel, too, has stipulated that any construction materials entering Gaza be closely scrutinized, to assure that Hamas does not use them in rebuilding the tunnels it uses for military purposes. With the delay in beginning the reconstruction of Gaza, Fatah and Hamas started to blame each other for the slow progress. While Hamas sees the national-unity government as a partnership, the Fatah-run Ramallah authorities see it as a restoration of the pre-2007 status. This major difference in views is now threatening the fragile Fatah-Hamas reconciliation agreement of April 2014. Both sides have contributed to the current deadlock, which is prolonging the suffering of Gazans. The delay in sending the international funds pledged for Gaza’s reconstruction has had a major effect on the humanitarian situation in the Strip. 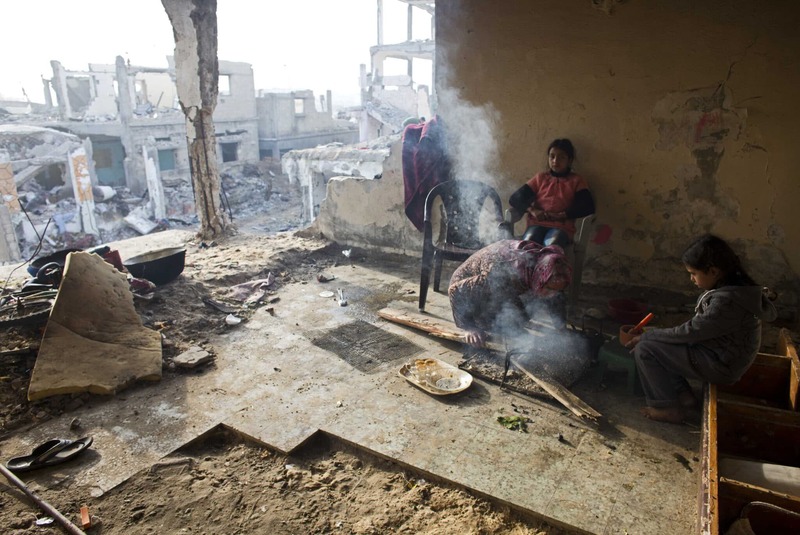 A general sentiment of discontent has been on the rise in Gaza, especially among those who lost their homes during the last war and have not yet received any aid or compensation for their losses. This feeling of discontent was translated into action on 28 January 2015, when dozens of Gazans who had lost their homes stoned and tried to storm into the offices of UNRWA and of Robert Serry, the UN Special Coordinator for the Middle East Peace Process in Gaza. The protests were sparked by an announcement by UNRWA that it would stop delivering aid to the families harmed in the last war. It was also an expression of discontent over the delay in the reconstruction efforts. In a statement on the protest, Adham Abu Saleemeh, the head of the Popular Movement to Break the Siege and spokesman of the Interior Ministry said in front of the UN offices, “We did not wish for things to go this far, but they have put the Palestinian people in a slow-death corner. Today, the world has partnered with the occupation to punish the Palestinian people collectively.” He stressed that, while Gaza lacks water, electricity, gas, and infrastructure and suffers from the siege, donors are stopping aid and reneging on their pledges. Abu Saleemeh held the international community and the Arab governments responsible for the deteriorating humanitarian situation in Gaza and the losses sustained by thousands of Gazan families. At the same time, Serry noted that Hamas, the ruling authority in Gaza, did not take the appropriate measures to defend the compound and that it was their responsibility to ensure the safety of UN personnel. He blamed the delay in reconstructing Gaza on the lack of cooperation between Hamas and the Palestinian Authority, adding that “we need a government capable of live up to its responsibilities.” Serry stressed the need for an effective and stable administration in Gaza, warning that the international donors would be worried about sending funds without seeing such an administration in place. Also, UNRWA has warned several times that the conflict might erupt again in Gaza. On 4 February 2015, Robert Turner, UNRWA’s Director of Operations in the Gaza Strip, said in a press conference that the current situation in Strip was worse than before Israel’s summer offensive (of July 2014). Turner expressed fears that the very difficult humanitarian situation in the besieged Strip could lead to renewed conflict, especially in light of the people’s frustrations. Turner said that UNRWA was forced by the lack of funds to suspend its cash assistance to tens of thousands of people in Gaza for repairs to damaged and destroyed homes and for rental subsidies to the homeless. He explained that UNRWA had received only $135 million out of the $720 million pledged during the Cairo donor conference.